Sen. Len Suzio (pictured at the Legislative Office Building) on Feb. 7 applauded the Connecticut Senate and House Republicans’ plan to reinstate nearly $20 million in education funding that was cut midyear to cities and towns throughout the state. The Republican proposal would allow the state to restore Education Cost Sharing funding that was cut by Gov. Dannel P. Malloy’s administration in December. The GOP plan also closes the state’s current budget deficit of $11.9 million as estimated by the Office of Fiscal Analysis. The plan can be viewed at www.ctsenaterepublicans.com . 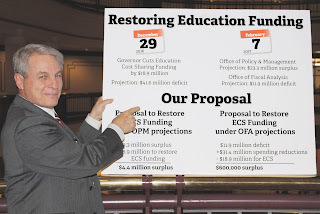 Sen. Suzio can be reached at 800 842-1421 and at Len.Suzio@cga.ct.gov . He represents Cheshire, Meriden, Middlefield, Middletown, and Rockfall. On the web: www.SenatorSuzio.com .